What does virtual water conceal? Virtual water and water footprint studies, when disembedded from all institutional and political processes alter our understanding of ecosystems, from complex systems thinking toward simple flow analysis. The concept of ‘virtual water’ was defined by Professor Tony Allan in the early 1990s. It is a revolutionary concept because it describes something never conceptualized before: the water embedded in trade products. Defined as the amount of water required to generate a product, virtual water helped to explain how the water shortage in the Middle East was managed by trading virtual water in the international market. While virtual water was defined as a theoretical indicator, the term ‘water footprint’ – which is the volume of water needed for the production of the goods and services consumed by the inhabitants of a country – emerged from the methodological attempt by authors Hoekstra and Hung to estimate virtual water. 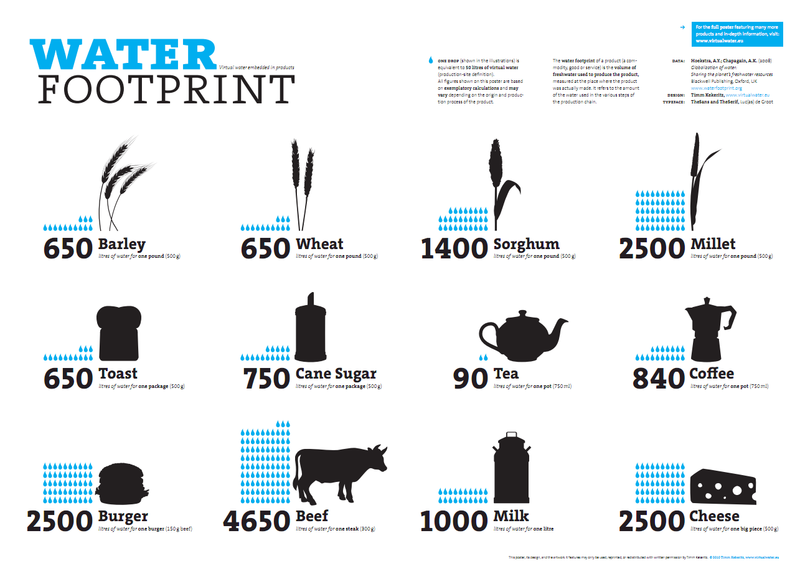 The water footprint of a product is the volume of freshwater used to produce the product. E.g. it takes 4650 litres of water to produce 300g of beef. Source: virtualwater.eu. Today the virtual water concept has been widely accepted across the scientific community, especially since the definition of the water footprint and the development of the methodology to estimate virtual water flows. After several years studying these indicators I started wondering why the virtual water concept became so popular, and on which underlying ideas it is based. I attempted to answer these questions in my article The Political Ecology of Virtual Water in Southern Spain (Beltrán & Velázquez, 2015), recently published online in the International Journal of Urban and Regional Research. It is through the dialogue between perspectives of ecological economics and political ecology that the contradictions in the virtual water approach can be illustrated, unravelling controversial concepts such as ‘scarcity’ and ‘efficiency’. Virtual water has been particularly influential among ecological economists, given their interest in the analysis of social metabolism (an analogy of the biological metabolism, applied to social and economic systems). As our bodies consume resources and produce waste, the same applies to an economic system. The Journal of Ecological Economics has published more than fifty articles on analyses of virtual water and the water footprint. Yet, ecological economics is supposed to question the assumption that the market would achieve maximum efficiency in the use and distribution of resources, or arguments that favour free trade in the name of the environment. Ecological economics focusses on the fundamental limitation of the monetary valuation of nature, and is interested in quantitative indicators, such as material flows or footprints, only as alternative metrics for quantifying the social metabolism of an economy. In this sense, I show why the methodological work of ecological economists will be politically ineffective and even contradictory if they adopt the virtual water approach uncritically. Virtual water and water footprint estimations make visible the ‘material origin’ of the conflicts caused by the water metabolism, as suggested by Martínez-Alier et al. (2010). However, at the same time, these estimations obscure the root causes of these conflicts by adopting market strategies as solutions, thus neglecting how issues of labour, power and unequal exchange affect water resources. The market logic conceals the fact that water is more than a factor of production; that scarcity may be socially constructed; and that the objective of efficiency in water use, if measured in relative terms, has very high social and environmental costs. Analyses of virtual water flows make the origins of a water conflict visible, but as long as these flows are not contextualized they may promote a prescriptive discourse that does not question the root cause of the conflict. This is exemplified in the case of Almería, in southern Spain. Despite being one of the driest areas in Europe, Almería is also Europe’s most productive agricultural region. This high level of productivity has very high environmental and social costs, since it has led to the overexploitation of aquifers in the area, among other things. A critical analysis of the local context reveals that this overexploitation has occurred as a result of the power relations developed around the concepts of water scarcity and water efficiency in the area, and because of the short-sighted vision of the markets. “Sea of plastic”. In Almería fruit and vegetables are produced year-round under the world’s largest array of greenhouses. 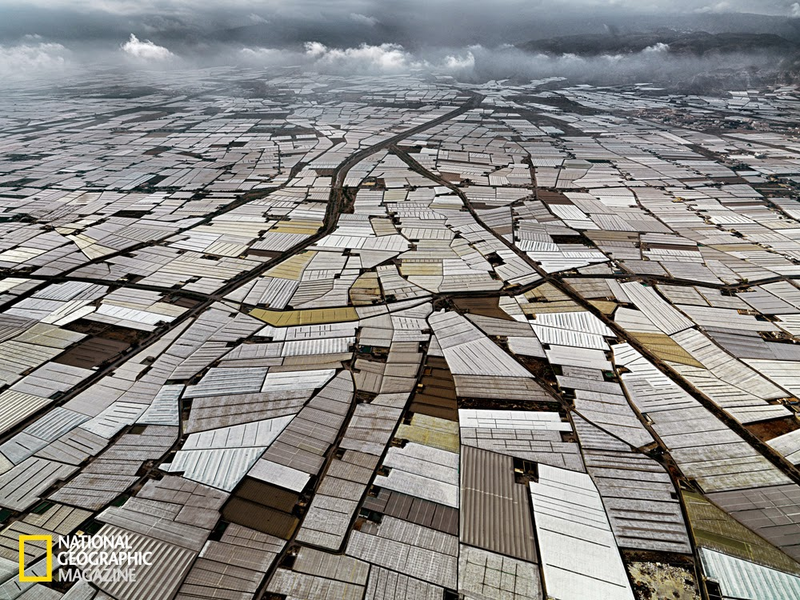 Photograph by Edward Burtynsky. Source: nationalgeographic.com. Some existing studies on virtual water flows in Almería (Chapagain and Orr, 2008) show that this Spanish province is exporting great amounts of water in the form of agricultural products, as a result of which it is overexploiting its aquifers. However, conclusions drawn from other virtual water flow analyses in the area claim that the high level of efficiency and the high monetary yield of virtual water exports justify this use of water, and validate the need to supply additional water to the production system, as well as the need to improve efficiency in the use of water resources. These conclusions are based on the idea that the water footprint of Almería’s horticultural sector is very small (Tolón et al., 2013). Why do we find different conclusions based on the analysis of the same indicator in the same area? One might argue that I should not criticise a concept because someone has used it in a specific way. And it would be right. However, by shedding light on the ideas underlying the concept of virtual water, it is possible to observe how the social construction of the concepts of water (as a factor of production), scarcity and efficiency is part of a descriptive discourse that challenges neither the (il)logic of the market, nor the (ir)rationality of international trade. As the study by Tolón et al. (2013) shows, the ideas of scarcity and efficiency are discursively employed to mobilize interventions in the hydrosocial cycle in Almería. The virtual water approach can be used to this end, because it is framed within the logic of the market and the rationality of international trade. In my paper I come to a conclusion similar to Norgaard´s (2010), who criticizes the metaphor of ecosystem services for reducing and simplifying complexity to inform markets. As I argue, the virtual water metaphor, disembedded from all institutional and political processes, similarly distorts how we understand socio-ecosystems, shifting us from complex systems thinking toward simple flow analysis. I think The Political Ecology of Virtual Water in Southern Spain is an interesting article for ecological economists and political ecologists who integrate biophysical data in their analyses. The attention paid by ecological economics scholars to the development and implementation of quantitative methodologies, which are capable of estimating biophysical flows in order to address the complexity of social and environmental problems, is noteworthy. However, there is an on-going struggle within ecological economics over whether this quantitative approach is contradictorily shifting us from complex systems thinking toward simple flow analysis. Spash (2013) claims that “shallow ecological economics” is more preoccupied with the reduction of everything to material and energy flow accounting, than with questions of social justice. He argues that the “number crunchers” have created an entire industry by speculating how different means of calculation could produce a response to environmental issues. This approach offers little that has not been on the agenda of environmental economists working within the current economic orthodoxy. Spash therefore calls for a “deep ecological economics movement”, to bring back into sight the original objectives of the discipline. Combining perspectives of ecological economics and political ecology provides an alternative viewpoint, with the objective of stimulating the discussion both among virtual water, and within the ecological economics community more broadly. Following Spash, I argue for moving away from an orthodox towards a deep ecological economics movement. Why? 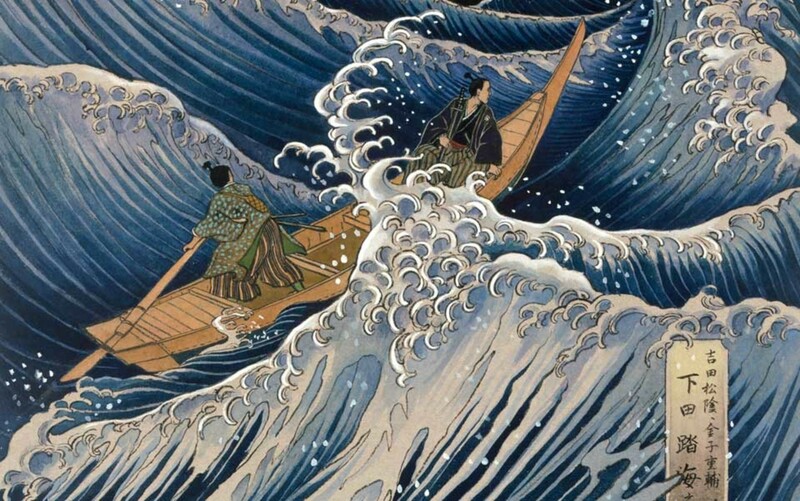 Riding the storms; detail from artwork by Kinuko Y Craft. Photo by National Geographic/Corbis.